Der Pz.Kpfw. II Ausf. D ist ein deutscher premium leichter Panzer der Stufe 2. Eine Ausführung des Pz. II mit großer Höchstgeschwindigkeit für leichte Divisionen, die der Kavallerie entstammen. Der Pz.Kpfw.II Ausf. D hatte komplett neue Wanne und Antrieb. Turm und Geschütze übernahm man von der Ausf. C. Das Laufwerk hatte acht große, paarige Räder mit Einzeldrehstabfederung unter Wegfall der Stützrollen. Einige Panzer waren mit verbesserten Antriebselementen ausgestattet, darunter Antriebs- und Umlenkrad, die für die Ausf. E gedacht waren. Je nach Quelle wurden etwa 200 bis 250 Fahrzeuge der Ausführungen D und E gebaut. The Pz.Kpfw. II Ausf. D was the 2015 New Year's gift tank. When put to paper, the II D appears somewhat mediocre in comparison to most other tier II tanks. Most prominent among its shortcomings are its very poor AP shell penetration and thin armor (excluding the front hull). Still, the II D benefits from a better top speed and improved maneuverability compared to its non-premium cousin, and with patience and thoughtful positioning it is easily more than capable of pulling its weight. The Pz.Kpfw. II Ausf. D's most noticeable feature is, unfortunately, its very poor penetration ability. 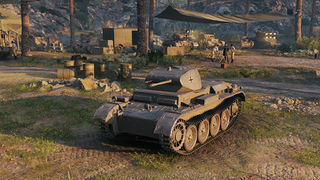 Its lackluster average penetration of 23mm with AP is the second least in the entire game and puts it behind even machinegun-armed tanks such as the T7 Combat Car. Unlike the T7 though, the II D has the option to fire APCR rounds with an average 46mm of penetration. 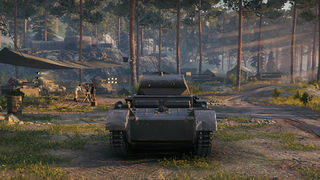 Thus, it is expected to pull the weight of a standard tier II and gets standard tier II matchmaking (meaning it will occasionally be put into tier III games). Though firing gold rounds will help to bypass the gun's poor AP penetration when needed, its inaccurate and rapid-fire nature means that doing so will often cost more money than the tank is capable of making. Loading only gold will cost 72,000 credits if you spend all of them firing without a care. 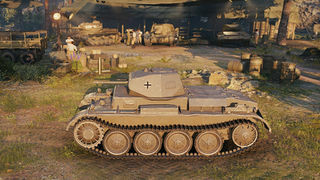 On top of all this, the II D also doesn't get the benefit of the regular Pz II's thick armor. The 30mm frontal hull armor is capable of bouncing off-angle, low-penetration shells, but elsewhere the II D's armor is thin and leaves it with very little protection (and will often be overmatched at odd angles by large guns). With all this in mind, proper positioning of the II D is paramount to a successful game. With its side or turret armor exposed for too long, enemy tanks will quickly chew through its large hitpoint pool. When used to shoot at the front of many tanks with AP, the II D will often fail to do any meaningful damage. The II D's good speed and maneuverability enable it to reposition when necessary and therefore allow it to stay protected while giving it the opportunity to take flanking shots on unwary enemies. The II D works best as part of a cohesive team or platoon, working over distracted tanks and cleaning up weaker ones by trading hitpoints.